METTLER TOLEDO Thornton is a leading supplier for on-line pure water treatment measurements for the pharmaceutical, microelectronics and steam and power generation industries. Thornton also serves these and related industries through system fabricators who incorporate high quality instrumentation into their pure water treatment system designs. 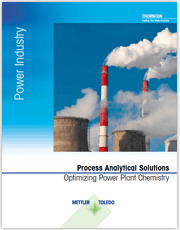 Get an overview of METTLER TOLEDO Thornton sensors and analyzers to keep power plant water running efficiently. Over fifty years ago, Thornton designed and manufactured the original analog resistivity meters for ultra-pure water. Later, we pioneered microprocessor-based resistivity instrumentation with the first computed high purity temperature compensation for this new industry. Over the years, Thornton defined resistivity limits and became the resistivity measurement standard in the semiconductor industry. METTLER TOLEDO Thornton instrumentation monitors all stages of water purification, including filtration and pre-treatment, softening, membrane separation, deionization, ozonation, UV treatment, and distillation. In addition, Thornton products are used for process monitoring in the pure water industries, e.g. 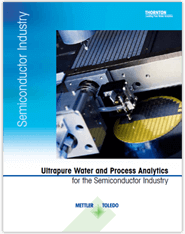 the release of pharmaceutical waters for use in the plant, the cycle chemistry conditions in power generation, and the purity of rinse waters in microelectronics manufacturing. Measurements on incoming water alert operators to seasonal and daily changes in water mineral content (conductivity) and pH to enable adjustments to treatment to maintain efficient operation. Chlorination ahead of filters prevents bacteria growth in the media. Dechlorination using bisulfite or carbon beds after the filters, monitored by ORP, prevents damage to membranes and ion exchange resins downstream. With very hard water conditions it is advantageous to reduce the hardness concentration before reverse osmosis or deionization to prevent scaling or difficult regeneration in these processes. Calcium, magnesium and other hardness ions are exchanged for sodium in a cation resin bed. The resin is regenerated with brine with its concentration controlled via a high range conductivity measurement. 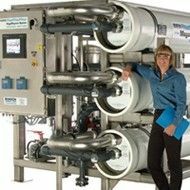 Reverse osmosis (RO) and other membrane processes are cost-effective water treatment technologies used in most industries to remove minerals, organics and other contaminants. Analytical measurements are critical to ensure proper conditions for optimal rejection of solutes and maximum recovery of purified water. Conductivity, flow, pressure, temperature and pH are important measurements needed for real-time performance monitoring and control and long-term trends in membrane health. These measurements save costs by identifying the need for cleaning and preventing membrane failure. They enable optimized operation and quickly detect any breakthrough or abnormal conditions. Deionization by ion exchange enables thorough removal of ionic contaminants. Cation resins remove positive ions and are frequently monitored by sodium measurement to detect the first breakthrough when the cation bed is depleted. Anion resins remove negative ions and are frequently monitored by silica or conductivity for breakthrough. Separate cation and anion beds are efficiently regenerated by acid and caustic which can have their dilution controlled by high range conductivity measurements with direct concentration readout. Mixed cation/anion bed exchangers are capable of removing the last traces of ions and are often monitored by sodium, silica and conductivity. Degasifiers use vacuum, heat and/or membranes to remove oxygen, carbon dioxide, nitrogen and other dissolved gases from water. Measuring dissolved oxygen at the inlet and outlet provides a good check on operation. CEDI is an electrically driven purification process combining ion exchange resin and ion-selective membranes to provide similar performance to mixed bed deionization but without chemical regeneration. Instead, the resin is electrically regenerated. Conductivity and flow measurements monitor system performance and ensure water quality. Ozone kills bacteria 1000 times faster than chlorine while leaving no breakdown products. Pharmaceutical, bottled water and microelectronics systems using ozone recirculate the water long enough to provide adequate contact time. Dissolved ozone measurement ensures adequate levels are maintained for treatment and a downstream measurement prevents ozone reaching the points of use where it would be detrimental to processing. In pharmaceutical and microelectronics pure water systems, UV deactivates micro-organisms, oxidizes organic compounds and destroys ozone by converting it back to molecular oxygen. Total Organic Carbon (TOC) measurement confirms organics reduction. Ozone measurement ensures that all ozone is decomposed. Pharmaceutical waters, including Water for Injection and Purified Water, are most commonly produced by distillation which guarantees sterility. 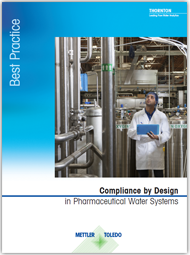 Conductivity and TOC measurements ensure that water quality is within regulatory limits.